Democrats in California's Senate doubled down on the state's commitment to reducing dependence on fossil fuels, painting their move in contrast to Donald Trump's potential withdrawal of the United States from the Paris climate accord. The Senate on Wednesday voted to set a goal of getting all of the state's power from renewable energy sources by the year 2045. The aspirational target in SB 100 builds on the existing mandate that half of the electricity produced in the state come from clean sources by 2030. 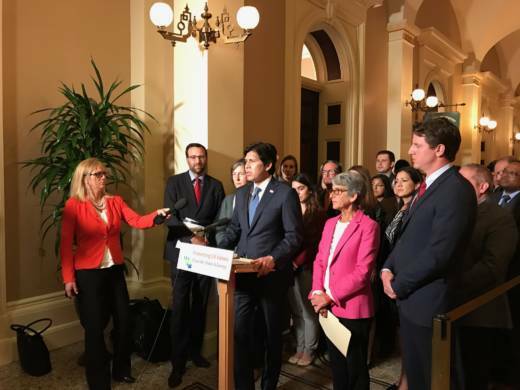 “At the time reaching a 50 percent renewable portfolio standard was an ambitious but attainable target," said Senate President Pro Tem Kevin de León, who wrote the bill. "But knowing what we know today, we clearly aimed too low." Republicans voted against the measure, arguing that the private sector should lead the push to help California reach its greenhouse-gas reduction goals. "I think we should let the technology drive the industry," said Sen. Jeff Stone (R-Coachella Valley). "The industry understands that there’s money to be made in alternative energies." A report from the U.S. Department of Energy earlier this year found that California is home to 40 percent of all solar energy jobs in the country. Solar energy production could rise as a result of another measure approved by the state Senate on Wednesday. SB 71 from Sen. Scott Wiener (D-San Francisco) would require solar panels to be installed on many new buildings in the state. "To meet our goals, we need solar and other renewable energy in every city and neighborhood in California," said Wiener. After the votes, Senate Democrats wasted little time contrasting their victories with reports that the United States would exit an agreement aimed at curtailing greenhouse gas emissions. Later Wednesday night, the president tweeted that his final decision would be announced on Thursday. In truth, California's goals to fight climate change already far surpassed what was agreed upon in Paris: that nations would voluntarily reduce their greenhouse gas emissions. Gov. Jerry Brown signed legislation last year that requires California's emissions levels drop to 40 percent below 1990 levels by the year 2030. The possibility of the U.S. withdrawal from the accord gave lawmakers in the state another opportunity to emphasize the state's departure from federal climate policy. "We’re showing the way forward," said de León. "We’re sending a clear message to the rest of the world that no president, no matter how desperately they may try to ignore reality, can halt our progress."